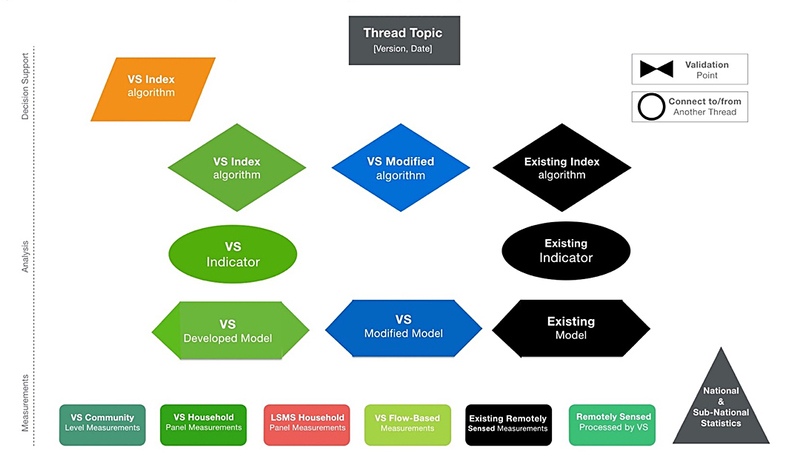 In the same way that fabric is woven of many threads, Vital Signs has multiple threads, which makes the system efficient, robust and adaptable to the needs of multiple users. Each ‘thread’ is a thematic cluster of information relating to a specific topic area. Examples include climate, wood fuel, livestock, water, resilience, biodiversity, food security, poverty, soil health, agriculture intensification, nutrition, health, and sustainability. The idea of ‘threads’ provides a way to link related information at different scales. Importantly, a thread connects a set of observations through various scales and levels of data synthesis, keeping it coherent and meaningful in each context. Threads provide a mechanism to reconfigure the system’s internal ‘wiring,’ to address new questions, and to draw in information collected at a different scale (and perhaps for a different purpose). ‘Threads’ also allow the system to operate simultaneously at multiple scales. Having multiple scales means that the information provided must be appropriate for that scale, and it must not contradict information at larger and smaller scales. It also accounts for the fact that the various physical, biological and social processes under observation have different fundamental scales, and that these interactions are an important feature of the Vital Signs socio-agro-ecological system as a whole.